The Wearable Technology Show isn't a big hitting behemoth tech conference like CES or MWC, but we've trawled the floor at the London event to find the weirdest and most innovative tech. No major tech announcements were made at the show, but it's packed full of strange gadgets mostly focused on health and fitness industries, but there's also a smattering of VR and AR too. We've put together this list of the five weird and wonderful products, prototypes and ideas we've seen shown off at the show. Some of them may never come to market, but each is worth knowing about if you're interested in technology you wear. You won't be able to buy this anytime soon, but one of the most fascinating prototype devices we saw at the show included an earpiece made by the National Physical Laboratory that specializes in accurate measurement standards. Accurately measuring how hydrated you are is a difficult task - one that often involves taking a blood sample - but this prototype device uses microwaves through your ear to see how much water is in your blood. This is in the very early testing stages right now - the NPL doesn't even know if it works accurately enough - but it's testing and changing it to ensure it one day will be. In the future it could become a consumer product designed to monitor how hydrated you are before, during and after a workout, or it could even be used to ensure professionals like fire fighters are drinking enough water. Always find your loved ones heavy breathing or snoring disturbs your sleep? If you've ever been in that situation, it's likely you've thought about putting on a noise-cancelling headset to block out the noise. Now you don't have to with the QuietOn Sleep earbuds. We tried out a demo and found the noise cancelling within these tiny, true wireless buds to be very impressive. You can generally hear voices with the headset on (so it won't block out any sleep talkers) but during the demo we couldn't hear the snoring sound effects we were played. If you do need to hear while you're wearing them, you can just tap them with your fingers to turn off noise cancelling. Unlike buying a specific noise cancelling pair of headphones, these are designed to sit comfortably in your ears even when you're rolling around on a pillow and offer up to 20 hours of battery life. Just don't expect to be able to listen to nursery rhymes to send you off to sleep. Unlike most other smart clothing, the technology inside these socks from Footfalls & Heartbeats is built into the textile itself. Rather than having a singular tracker on the bottom, top or side of the sock, the innovative knit structure is what monitors your stats. This has limited use cases, so these aren't socks designed for you to work out in – instead it's just an example of how the tech could be used to measure compressive forces. The use case Footfalls & Heartbeats gives for these socks is it can be worn by the elderly or vulnerable people to alert loved ones when they haven't worn their socks or gotten out of bed for a certain amount of time. It's not just the socks either - the company thinks it'll be able to apply this technology to various garments in the future. Right now it's just a prototype experiment, but it's a potentially a big step forward in smart clothing. 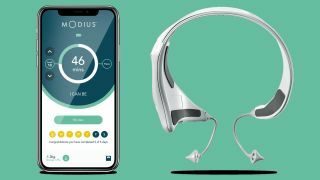 The Modius website says the headset "generates a low-level electrical pulse that is interpreted by the brain as a signal to become leaner." We don't currently know if that technology is going to work in the long run. If you want to know exactly how the Modius feels to wear, read about the time TechRadar Global Editor in Chief Marc Chacksfield strapped on the headset and had a go at MWC this year. developed in a joint venture between Nottingham Trent and Southampton universities and research partner Bonnie Binary - is a remarkable innovation. The LEDs for lighting up certain elements of the clothing are built into the fabric itself, rather than being an annoying strip that you can feel and see on your clothing. It won't effect the fit, style or look of the outfit. It could mean you could have a dress – much like the one pictured above – that just looks normal to the naked eye, but then you’d be able to hit a small button or an app on your phone to immediately light up on a night out. This especially could be interesting in sports wear for when you're exercising at night and want to be visible on the roads or you just want to improve your own visibility for safety.